(Reuters) - McDonald's Corp blew past analysts' forecasts for profit and revenue on Monday, helped by higher sales in overseas markets and as U.S. customers spent more at its outlets. Shares of the world's biggest fast food chain by revenue rose more than 5 percent as global same-restaurant sales topped Wall Street forecasts, driven by the strength in mature markets especially the United Kingdom and Germany. The stock was also the top gainer on the Dow Jones Industrial Average. The results underscore the success of Chief Executive Officer Steve Easterbrook's multi-year turnaround plan launched in 2015 to refresh McDonald's menus, add more technology to stores and make outlets more welcoming for customers. New changes also included adding more high-margin "gourmet" burgers, which use fresher and more expensive ingredients and cost $6 or $7, and new $1 to $3 value options. Same-restaurant sales in its most profitable market, the United States, rose 2.9 percent and topped analysts' expectations on higher average check tallies that was propelled by consumers opting for $1-$3 value menu items, while also adding more expensive burgers. "The value price menu does bring people in, but people tend to spend more ... people still want a number of key McDonald's items like the Quarter Pounder and the Big Mac," Tigress Financial Partners analyst Ivan Feinseth said. McDonald's and other fast food chains have been concentrating on drawing customers with cheap options as they battle for a bigger share of a pie that is not growing. But a weak initial consumer response to the company's $1-$3 menu prompted McDonald's to offer a 2 for $4 "mix & match" deal on breakfast sandwiches to thwart intense competition in the all-day breakfast category, Easterbrook said on a post-earnings analyst call. Customer visits in the U.S. declined, but rose notably in Japan, France, Australia and Canada leading to an overall traffic rise of 0.8 percent. Global sales at stores open at least 13 months rose 5.5 percent, easily topping an average estimate of 3.94 percent. "(This) shows the power of the brand ... globally the numbers were outstanding," Peter Saleh, an analyst with brokerage BTIG, said. "The results were very impressive, actually more impressive than we initially had anticipated." 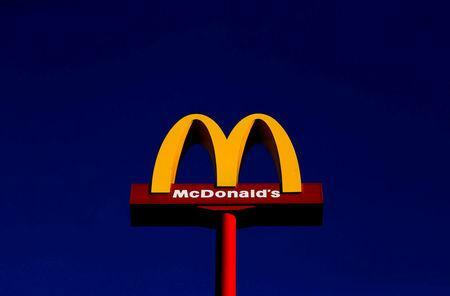 Excluding items, McDonald's earned $1.79 per share, beating the estimate of $1.67. Revenue fell 9 percent compared to a year ago, as it sold more McDonald's-owned outlets to franchises to cut costs, but beat estimates.